Local Grant Allows Pre-School to Enjoy the Outdoors Whatever the Weather - Able Canopies Ltd.
From left to right: Paula Bland – Frating Parish Council, Michelle Salazer – Frating Parish Council, Ruth Slater – Acting Head Teacher at St Georges Primary School, Kim Hardy – Landowner for Solafields Project in Ardleigh and Karen Montgomery – Manager Little Dragons Pre School. Little Dragons Pre School in Great Bromley are reaping the benefits of their new canopy which allows them to play and learn outside all year round. The children can now create concoctions with their mud kitchen, get lost in story time and enjoy free-flow play in the fresh air whist keeping sheltered from the weather. 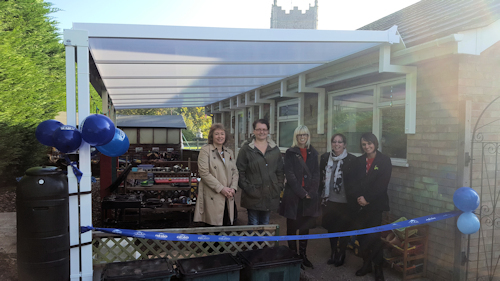 Their canopy was officially opened this week with a cutting of the ribbon however, the children and parents have been enjoying the benefits of their new canopy for a couple of weeks now. The staff had been hoping to add a canopy to their facilities since they moved to their current premises back in January 2013 and was finally able to do so with the grant that they gratefully received from the Ardleigh Solar Farm Community Benefit Fund. The pre-school which has been running for 40 years and cares for around 30 children, has received many positive comments from parents about the canopy which was supplied by Able Canopies Ltd. as they can now also keep dry when picking their children up. The above press release made it into the Great Bromley and Little Bromley village magazine 'The Messenger'. Click here to view it online.